The WHMCS Billing System offers you a lot of opportunities to grow and expand your web hosting or web development business. You can apply a number of different features to WHMCS that incorporate different applications and programs onto your system that will give your company a competitive edge. One such application is the Live Chat feature, and this can be applied directly the WHMCS platform for easy integration and installation. The great thing about using WHMCS is that when you install live chat or any other plugin to your system, you will have a large number of resources at your disposal to assist you in the event that you encounter a problem. The customer support for WHMCS is multi-faceted and incorporates Wikipedia information, community forums, and professional services if necessary to complete your virtual environment. Installing a Live Chat system on WHMCS is a great way to give your customers an add-on that they will be sure to use. Live chat can be used on any server or hosting platform for additional support and to answer customer questions when necessary. There are a lot of great features that a reseller or hosting company can use to increase the functionality of the websites on a server. The WHMCS Live Chat feature gives your users the ability to contact your support department directly and obtain information on products, pricing, sales, and shipping policies. 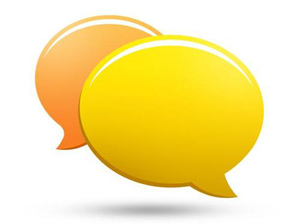 Live chat is a great feature and one that is used on many business websites. WHMCS Live chat is an application that can be installed after you have obtained the licensing for the WHMCS software program. Then you can enjoy many more features and applications along with an automated billing system on your server so that your clients will have a wide array of options to consider when they select your business. Billing Systems and eNom Accounts – What do they have in common? While everyone who is involved in any web related business, understands that keeping track of your customers and billing them on time is essential. Many of our billing system license holders happen to be in the web hosting industry. Of which, a wide selection of customers wanted to start offering domain names, but without the cost of actually purchasing a eNom reseller account, which is to be frank, is expensive and not as easy as it seems. Having understood the challenge that we faced, we started figuring out ways we could tackle this issue. After a few days of digging (which we will admit, there is a massive amount of different registrars and reseller features offered) we saw that again eNom had the best line up of price, tld support, and existing billing system integrations. A module that we could integrate into our billing system which would allow all of our customers (new and existing) the opportunity to obtain a free eNom account. Not only is this a free eNom account, this will also be an automatic process so you don’t have to fill in a billion fields like you would otherwise have to at eNom. When ordering a billing system, be it a Blesta license, WHMCS license, or any other sort of billing system within our lineup, you will now be offered a free eNom account with your purchase! Again, we are very excited to be able to offer this service to you our customer. We wish you the best in all of your endeavors. WHMCS V4.4.2 – Have you tried the latest version? For all of you WHMCS lovers out there, we at LicenseCube know how excited you were about the release of version 4.4.1. This version had some very nice features including probably everyone’s favorite…features for better optimization of your machine. This version also fixed some of their previous bugs, added support features, and many other improvements, making this an all-around awesome release for WHMCS! Just as we are getting over our excitement, we are now introduced to WHMCS V4.4.2! “What else can be added?” you ask. Well, let’s take a quick look. For this newest version, you can expect a lot of maintenance to any of the bugs that were previously reported and fixes to both versions 4.4.0 and 4.4.1. 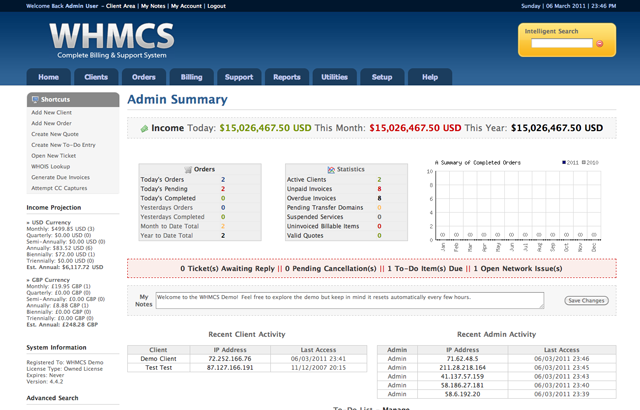 We hope you will enjoy the latest version of WHMCS billing system! WHMCS V4.4.1 – Have you tried the latest version? If you are one that uses WHMCS, you were probably excited when V4.3.1 came out last year. After all, WHMCS is already one of the best client billing and support management solutions. V4.3.1 stable release brought us features such as ajax order forms, twitter integration, customizable admin email templates, new addon features and much more. Recently, WHMCS introduced their latest version, V4.4.1 Let’s take a quick look at some of the newest features to show how they will benefit both you and your clients. Probably the most exciting features added are those that bring more optimization. This is a feature that everyone can agree is beneficial, after all, who doesn’t like to get every last bit of performance out of their system! For those who found the ajax order forms useful, there have been some improvements to this such as the ability to prevent orders when out of stock, custom client field support as well as fixes to the last version. If you take advantage of the Multi-Language features, there is now Admin Area support with the ability to upgrade and downgrade. Also in this area there are added invoicing features such as the ability to split and merge invoices, mass product/service updates, added options for credit card processing, updated PayPal language settings, as well as many other domain management and support system adds, fixes and improvements. For those who are interested in what WHMCS can offer you and your business or just choose other billing system you can learn more at LicenseCube – Billing Systems.